1. the same /2 times as far. 3. four times as far. 1 1. the same. 2. 1-1/2 times as far. 3. four times as far. The brakes are slammed on a speeding truck and it skids to a stop. If the truck were heavily loaded so it had twice the total mass, the skidding distance would be Ch 7-1 1. the same /2 times as far. 3. four times as far. 2 1. the same. 2. 1-1/2 times as far. 3. four times as far. The brakes are slammed on a speeding truck and it skids to a stop. 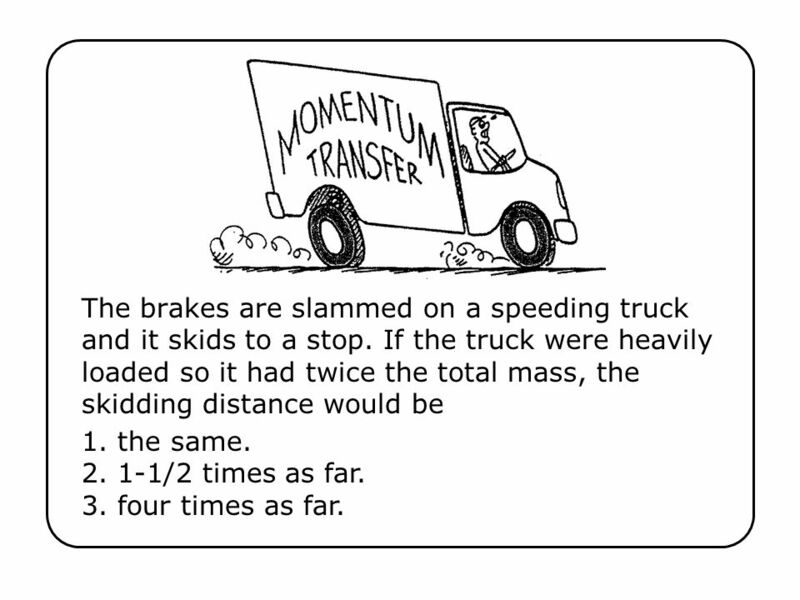 If the truck were heavily loaded so it had twice the total mass, the skidding distance would be Ch 7-1 Answer: 1 Twice the mass means the skidding tires will bear against the road with twice the force, which results in twice the friction. Twice as much friction acting on twice as much mass produces the same deceleration and hence the same stopping distance. 1. the same /2 times as far. 3. four times as far. In which car will you be moving the fastest at the very bottom of the incline? 1. Front car 2. Middle car 3. Rear car 4. Other Ch 7-3 Thanks to Joe Delaney. 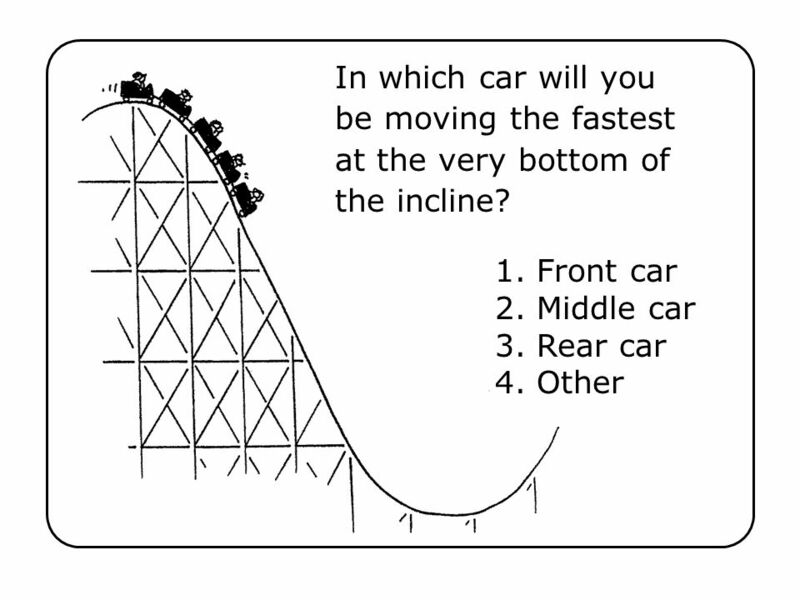 In which car will you be moving the fastest at the very bottom of the incline? 1. Front car 2. Middle car 3. Rear car 4. Other Ch 7-3 Thanks to Joe Delaney. Answer: 2 The middle car. Of course, at any moment all cars have the same speed, but the gravitational potential energy of the system of cars is least when the middle car is at the bottom—when the center of mass of the system is lowest. Lowest potential energy means highest kinetic energy. So sit in the middle car for the fastest ride at the very bottom! 5 Two smooth tracks of equal length have “bumps”—A up, and B down, both of the same curvature. If two balls start simultaneously with the same initial speed, the ball to complete the journey first is along Ch 7-4 1. Track A. 2. Track B. 3. Track C.
6 Two smooth tracks of equal length have “bumps”—A up, and B down, both of the same curvature. 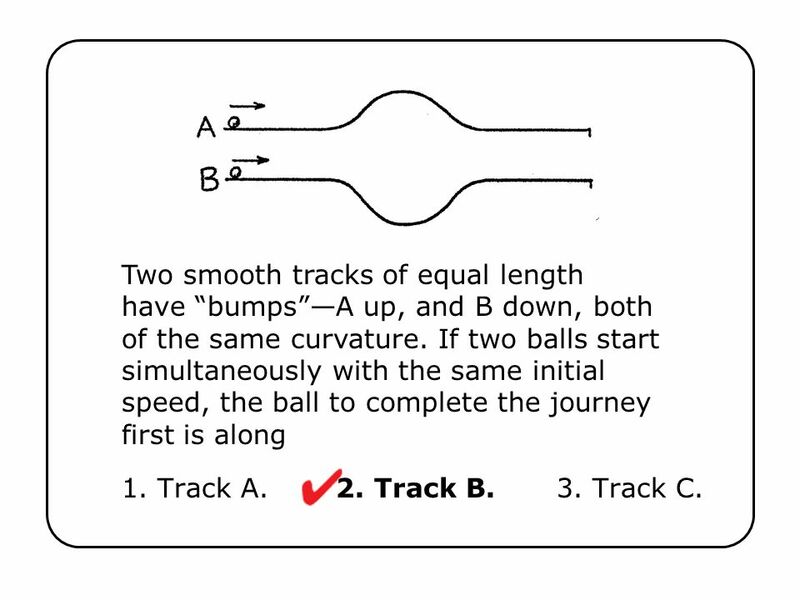 If two balls start simultaneously with the same initial speed, the ball to complete the journey first is along Ch 7-4 Answer: 2 Although both balls have the same speed on the level parts of the tracks, the speeds along the curved parts differ. The speed of the ball everywhere along curve B is greater than the initial speed, whereas everywhere along curve A it is less. So the ball on Track B finishes first. Does the gain in speed at B’s bottom equal the loss at A’s top? No! Speed isn’t conserved: energy is. The loss in kinetic energy at the top of A will be equal to the gain in kinetic energy at the bottom of B—if there is enough energy to begin with. There isn’t because the initial KE	is less than the gain in KE at the bottom of B . At 2 m/s, the ball will not even make it to the top of A’s curve. 1. Track A. 2. Track B. 3. 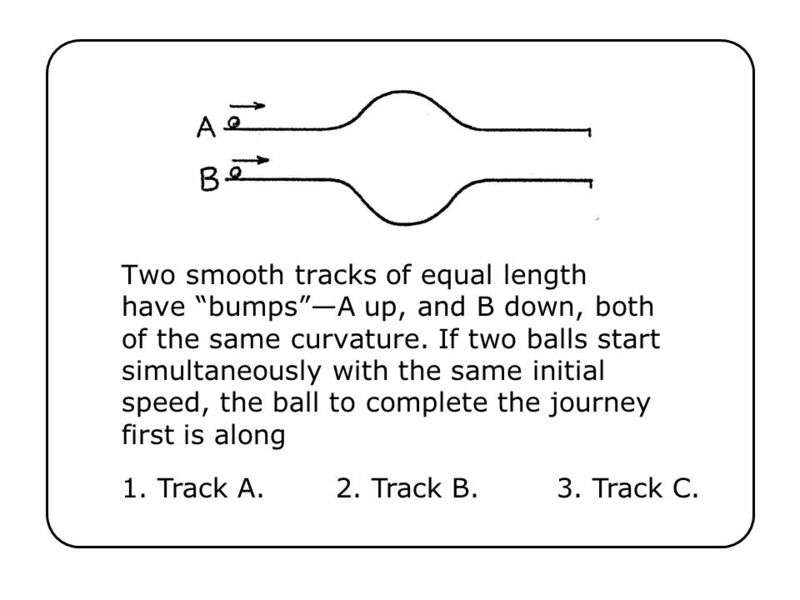 Track C.
7 Two smooth tracks of equal length have “bumps”—A up, and B down, both of the same curvature. 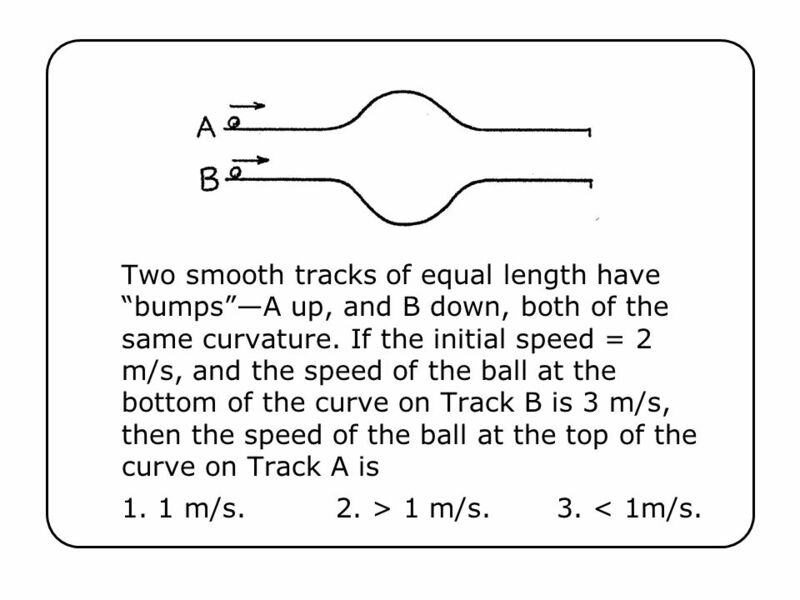 If the initial speed = 2 m/s, and the speed of the ball at the bottom of the curve on Track B is 3 m/s, then the speed of the ball at the top of the curve on Track A is Ch 7-4 1. 1 m/s. 2. > 1 m/s. 3. < 1m/s. 8 Two smooth tracks of equal length have “bumps”—A up, and B down, both of the same curvature. 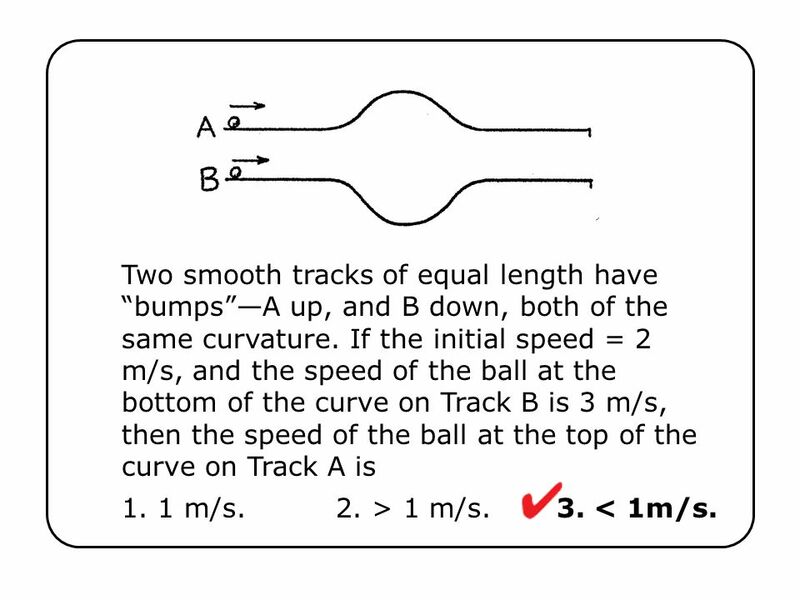 If the initial speed = 2 m/s, and the speed of the ball at the bottom of the curve on Track B is 3 m/s, then the speed of the ball at the top of the curve on Track A is Ch 7-4 Answer: 3 Although both balls have the same speed on the level parts of the tracks, the speeds along the curved parts differ. The speed of the ball everywhere along curve B is greater than the initial speed, whereas everywhere along curve A it is less. So the ball on Track B finishes first. Does the gain in speed at B’s bottom equal the loss at A’s top? No! Speed isn’t conserved: energy is. The loss in kinetic energy at the top of A will be equal to the gain in kinetic energy at the bottom of B—if there is enough energy to begin with. There isn’t because the initial KE	is less than the gain in KE at the bottom of B . At 2 m/s, the ball will not even make it to the top of A’s curve. 1. 1 m/s. 2. > 1 m/s. 3. < 1m/s. 9 1. A. 2. B. 3. C. 4. Either A or C. 5. All strike with the same speed. 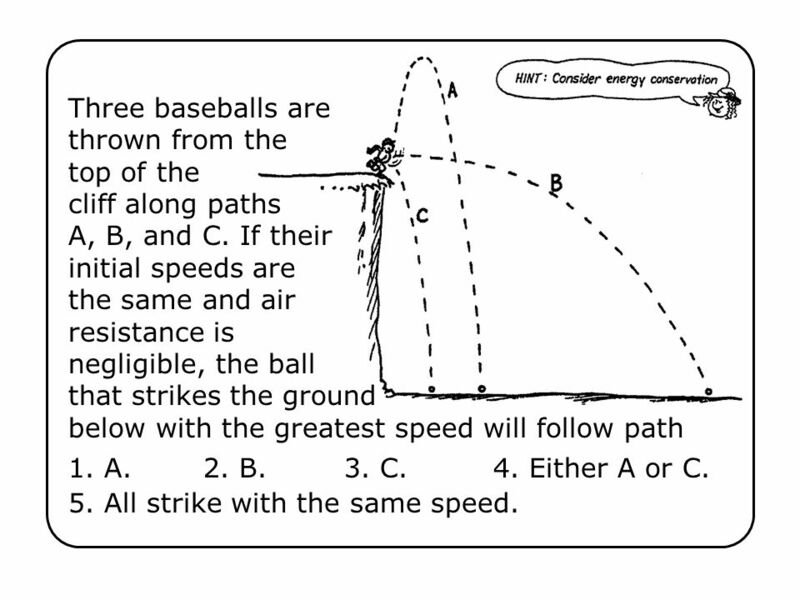 Three baseballs are thrown from the top of the cliff along paths A, B, and C. If their initial speeds are the same and air resistance is negligible, the ball that strikes the ground below with the greatest speed will follow path Ch 7-5 1. A. 2. B. 3. C.	4. Either A or C. 5. All strike with the same speed. 10 1. A. 2. B. 3. C. 4. Either A or C. 5. All strike with the same speed. 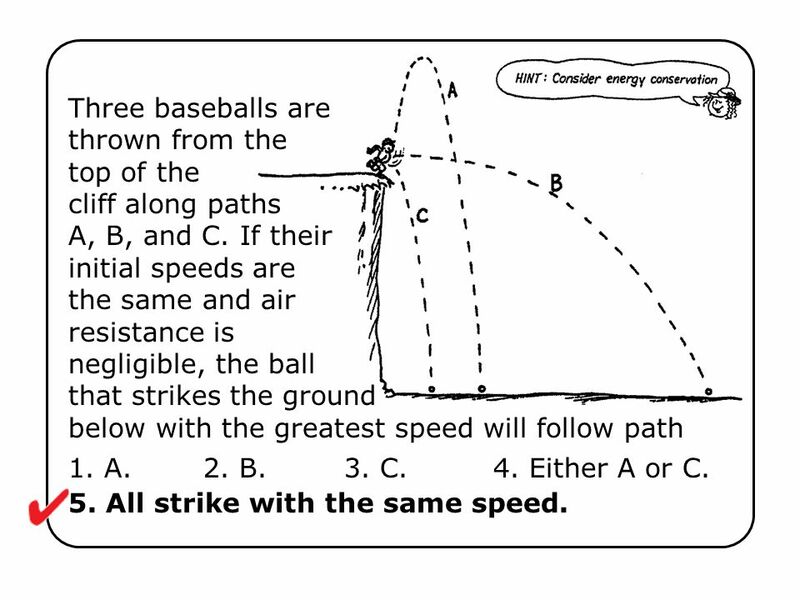 Three baseballs are thrown from the top of the cliff along paths A, B, and C. If their initial speeds are the same and air resistance is negligible, the ball that strikes the ground below with the greatest speed will follow path Ch 7-5 Answer: 5 The speed of impact for each ball is the same. With respect to the ground below, the initial kinetic + potential energy of each ball is the same. This amount of energy becomes the kinetic energy at impact. So for equal masses, equal kinetic energies means the same speed. 1. A. 2. B. 3. C.	4. Either A or C. 5. All strike with the same speed. Download ppt "1. the same /2 times as far. 3. four times as far." Standardized Test Prep © Houghton Mifflin Harcourt Publishing Company Preview Multiple Choice Short Response Extended Response. Fisica Generale - Alan Giambattista, Betty McCarty Richardson Copyright © 2008 – The McGraw-Hill Companies s.r.l. 1 Chapter 4: Motion with a Changing Velocity. Page 24 #10 If the stone had been kicked harder, the time it took to fall would be unchanged. Energy Conversion of Energy Forms of Energy Energy Work. Dr. Joseph W. Howard ©Spring 2008 Energy What is it? It is how nature keeps score. Like a “currency” of the universe. To cause a change requires energy. Preview Multiple Choice Short Response Extended Response.